Some comments I wrote to a specialist email group, composed of mathematicians and various academics. Use any info as you wish. Should any of the recipients in the Vancouver bureaucracy have any information that clearly indicates that carbon dioxide has an effect upon either global temperatures or the climate, please let me know. What I can say though is that until such time that the scientific community comes to realise that their pet theory of a greenhouse effect (based as it is on greenhouse gases) is unreal, until that time will the climate alarm continue. I know not what else to write to convince them of this fallacy. Neither water vapour nor carbon dioxide are GHGs; if anything at all, they are superb anti-GHGs; they cool the atmosphere! Monckton himself writes : “[…] The predicted phenomenon is startlingly and entirely absent from the observational record – No “greenhouse warming” signature is observed in reality” – from http://scienceandpublicpolicy.org/images/stories/papers/monckton/whatgreenhouse/moncktongreenhousewarming.pdf pg 7. Yet he admonishes me for my “ignorance” with regard the basic radiative transfer formulae?! All formulae relating to radiative transfer in our open-to-space atmosphere are chasing their own tail, but how can I prove it? Then I wrote the layman’s guide to how the atmosphere works, with not one word of response by the RS. Nobody listens, nobody wants to know. The GHE and the concept of GHGs are sacrosanct. Period. Fact of life: both GHE and GHGs are fantasmas; exactly the same as phlogiston in its day. Fact of life: no evidence for any hot-spot has ever been observed. Fact of life: such a hot-spot will never be observed because it can not exist in the open-to-space atmosphere; only in lab flasks can it exist. The problem all along, of course, is that people jump to conclusions. Sure, concentrated CO2 exposed to infrared will get somewhat warmer than everyday air. But this only proves that everyday air (99.96% of which is nitrogen, oxygen and argon) is more transparent to IR and less apt to be heated that way. Air molecules, CO2 included, initially acquire heat by contact with warmer surfaces. Via mutual collisions and convective transport, this heat gets spread around within an airmass. Moreover, any heated gas radiates infrared — and in this case 99.96% of the gas consists of molecules other than CO2. Yet no one seriously imagines that back-radiation from 99.96% of the air has a role in raising the earth’s surface temperature. Only when CO2 comes up do we lose touch with reality. Here’s a succinct point: Immersed in the vacuum of space, the earth has but one means of losing heat: radiation. And what does carbon dioxide do? It radiates. It’s amazing that so few people have bothered to give this theory a second look. So, there you have it. In just a few sentences Alan manages to point out how impossible it is for CO2 to make the atmosphere warmer. Yet Professors of Physics and UK MPs who have degrees in Physics are happily proclaiming that the atmosphere is warmer because CO2 “traps” heat. 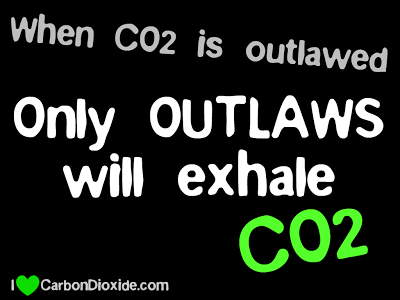 Learn about the benefits of adding more CO2 to our atmosphere.